Introduction: Trimetazidine and Metoprolol combination is more effective in the treatment of cardiac disorders as compared to single drug therapy. 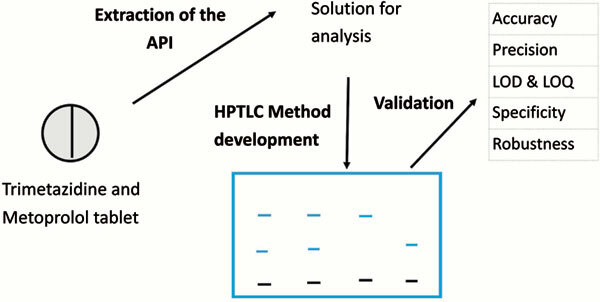 Materials and Methods: A rapid, simple, and sensitive HPTLC method was developed for the simultaneous determination of Trimetazidine and metoprolol from its tablet dosage form and validated. In HPTLC method, standard and sample solutions of Trimetazidine hydrochloride and metoprolol succinate were applied on pre-coated silica gel G 60 F254 TLC plate, and developed by using mobile phase, n-butanol :water: methanol: ammonia as solvent (8.5:0.1:0.1: 0.85, v/v). The drugs on plate were scanned at 213 nm. The method produced compact and well-resolved bands at Rf of 0.32 ± 0.02 and 0.66 ± 0.02 for Trimetazidine Hydrochloride and Metoprolol succinate respectively. The range for linearity was observed as 500-2500 ng band-1 for Trimetazidine hydrochloride and 500-2500 ng band-1 for metoprolol succinate and correlation coefficient were 0.9991 and 0.9997 respectively. Conclusion: The developed method was validated according to the ICH guidelines for precision, accuracy, Limit of detection, Limit of quantitation, specificity and robustness. The method was checked for suitability in determination of Trimetazidine hydrochloride and Metoprolol succinate in their tablet dosage form. The assay result was found to be 99.64 % ± 0.45 and 99.94 % ± 0.53 of percentage label claim for Trimetazidine hydrochloride and Metoprolol succinate respectively. Trimetazidine hydrochloride, metoprolol succinate, HPTLC, method development & validation, mobile phase, optimization.